Hi. My name is Deanna and I am a Psychic Medium and Healer. I have been given God given gifts and I would love to have the opportunity to share them with you! I am a positive, creative person with a genuine heart and a need to help others in one way or another (and another). I believe in the power of positive thought and believe we are all one. I have studied Pranic Healing, Paramitas and various healing and meditation techniques. I have owned my own metaphysical shop and have taught/teach many classes on various metaphysical things. I have an interest in health and healing and education. I work with my Angels continually. Gratitude is something I incorporate into each and every day. I am a mother of six beautiful, creative kids. 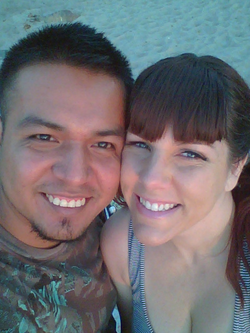 My husband, Andres, is my Twin Flame and he and I do healings together. I love animals and nature. The ocean and the forest are my favorite healing spaces. Meditation is a technique I use to create more calm, clear space in my life. Energetics are an important part of my life and I love to share what I know about it to help you in your life. My readings are accurate, direct and honest. They provide clarity, start you on a path of healing and are designed to move blocks so you can navigate through life with more ease. I work with Divinity and also use Angels, Spirit Guides and your Higher Self to assist with information. Honestly, I have a whole team! What they give to me I pass onto you. I can also use cards, crystal ball, tea leaves, flame and scrying. The best readings happen when you open your heart to the information coming through. Often loved ones from the other side will show up with messages as well. Because I also do mediumship I can do readings with the sole purpose of connecting with someone special. My readings are generally 45 minutes in length, with time for any unanswered questions. I do record the reading and send it to you via email. I also offer packages to really help you accomplish more specific goals. I can read over the phone, in person and I also do parties and events. You can reach me to set up an appointment by calling 909-713-4533 or email me at deannaleepsychic@gmail.com.